Haley’s Corker is the World’s only 5-in-1 multi-purpose wine stopper. Often called ‘the Swiss Army Knife of wine tools,’ it aerates, pours, and filters wine, re-corks and is a leak-proof wine bottle stopper! It fits easily into most standard-sized bottles. It’s vented for a smooth, perfect pour that’s splash and drip free. No more stained tablecloths! It’s specially designed to aerate newly opened bottles and release wine’s full aroma and flavor instantly. Aerating wine, swirling it in a glass or letting it “breathe” in a wine decanter, is an important step in developing its bouquet and softening its flavor when a bottle is first opened. Avoiding exposure to an abundance of oxygen is equally important, if consuming it at a later date. Exposure to oxygen for long periods of time deteriorates wine’s quality and taste. Wine corks allow oxygen to re-enter the bottle, causing the wine to spoil quickly. Haley’s Corker aerates wine instantly, and filters out cork residue, sediment and tartrates all at once, while it pours. 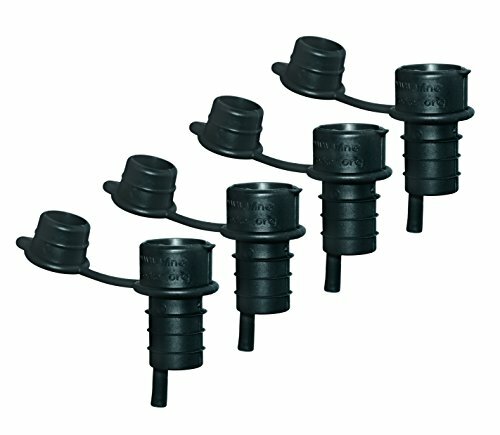 Its leak-free cap reseals opened bottles to protect contents and keep them fresher longer. It’s great for keeping out debris and bugs for effortless outdoor entertaining. When ready for another glass, simply lift the cap, pour a glass, and press closed to reseal. It’s perfect for drip-free pouring and to re-cork unfinished liquors and spirits, coffee syrups, champagne, sparkling water, extra virgin olive oil, or EVOO, canola oil, and vegetable oil, plus balsamic vinegar, and more to preserve and extend freshness. Save space by storing bottles on their side with no leaks! Compact to store in the kitchen gadget drawer or with bar supplies or other wine accessories. Great gifts for wine lovers and mixologists or coffee gifts for at-home baristas and coffee lovers. Proudly made in the USA from BPA-free, food-safe plastic, Haley’s Corker is reusable and will never rust. Dishwasher safe for easy cleanup. Set includes 4 Bottle Stopper Pourers. If you have any questions about this product by Haley's Corker, contact us by completing and submitting the form below. If you are looking for a specif part number, please include it with your message.